In large skillet, sauté guanciale (or bacon) over medium heat until most fat has rendered out; remove from pan. Add diced onion to pan and cook over low heat until translucent. In medium-sized pot, melt 1 pound butter. Add sliced lobster mushrooms and cook covered over low heat for approximately 15 minutes, or until fork tender. Remove mushrooms from butter and cool. Cut into smaller chunks. Reserve butter for later. In large mixing bowl, add onions, mushrooms, guanciale, chives, parsley, tomatoes and corn. Set aside. In separate bowl, add all duck eggs and beat well. Whisk in heavy whipping cream and crème fraîche. Strain reserved butter and beat into egg-cream mixture. Gently oil a 10-inch spring-form pan; line with pastry, gently crimping edge around top. Generously season onion-mushroom mixture in large bowl and toss. Pour into pastry-lined pan. Pour egg mixture over and return to cooler to chill for 10 to 15 minutes. Once chilled, place in 425°F oven for 35 minutes. Reduce temperature to 350°F and cook for another 35 to 40 minutes, or until center is set and knife inserted comes out clean. Let rest for 10 to 15 minutes. Enjoy warm or room temperature. Optional: Garnish with fresh greens or tomatoes. 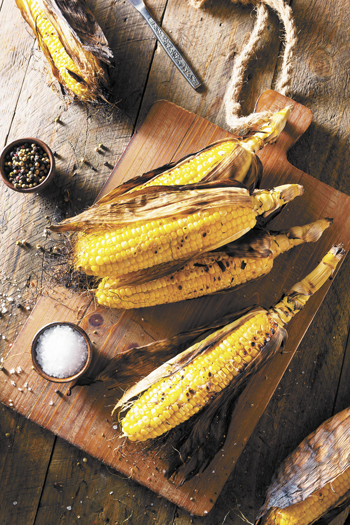 Season corn with salt and pepper. Drizzle with olive oil and roast over hot grill, or large sauté pan, for a few minutes on each side until lightly browned. Set aside to cool. Cut all tomatoes in half and toss in large bowl, seasoning with salt and pepper. Drizzle olive oil and add crushed garlic, thyme and rosemary. Place tomatoes on a baking sheet, skin side up, and into 450°F oven for 15 to 20 minutes, or until skin is lightly browned. Remove from oven. Discard skins and herbs. Allow to cool. Once cool, remove seeds; reserve flesh in small mixing bowl. Finely chop remaining garlic; add to tomatoes. 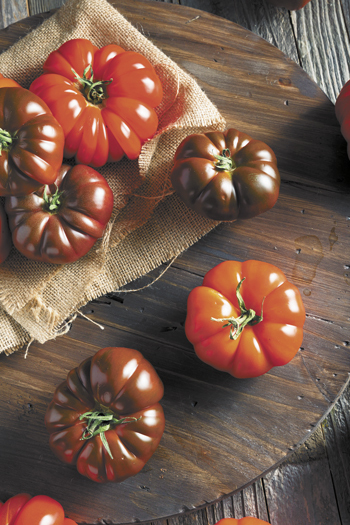 Smash tomatoes with fork; add champagne vinegar. Season to taste. Set aside in cooler. Cut corn off cob and place cobs in large pot with milk. Simmer for 10 to 15 minutes. Let stand to cool. Strain and discard cobs. In a separate pot, place corn kernels, whipping cream and bring to a boil. Let stand to cool. Once cool, add milk to cream and corn mixture. Add cream and corn mixture to blender, processing on high until smooth. Alternately, add olive oil and butter until thickened. Season to taste. Reserve in cooler until ready to serve. To serve, fold in sour cream and buttermilk. Pour into chilled bowls. Garnish with roasted tomato salsa. Trout or sturgeon roe make for a wonderful garnish if you desire. In medium pot, place ham hocks and cover with water. Simmer for 30 or 35 minutes until meat is tender enough to pull from bone. Remove and reserve meat. Bring same cooking liquid to a boil. Add favas or peas. Cook for 1 to 2 minutes; then place favas or peas in separate bowl of ice water. Save cooking liquid for later. In large skillet, add touch of olive oil and cook onions over low heat until just cooked. Add meat from hocks to onions. Add corn and tomatoes to pan and cook until tomatoes are just soft. Then add squash. Add enough cooking liquid to barley cover all vegetables. Simmer for 15 to 20 minutes. Add cleaned favas or peas and cook for a few minutes more. Season to taste. Garnish with freshly chopped basil and fresh chèvre.